Donovan Clark‍ made the trip all of the way from the Pacific Northwest to Notre Dame this week and the 2020 Washington cornerback is glad he did. “It was amazing,” Clark told Irish Sports Daily afterward. “Everything blew my mind from the start of the spring practice to the PowerPoint. It really got my attention. Notre Dame assistant coach Brian Polian delivered the PowerPoint presentation on what it means to be excellent. One theme Clark heard throughout the visit was how the people at Notre Dame challenge student-athletes on and off the field. “I heard it from everywhere during the tour,” he said. “That was one major core value that I loved to hear. Irish defensive backs coach Todd Lyght made a major impact as well. 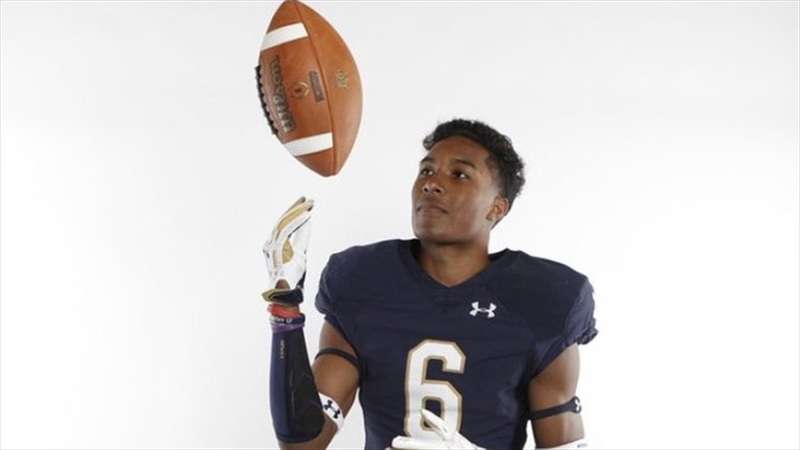 Clark, who made the trip with fellow Heir Football Academy athletes Kasen Kinchen‍ and Emeka Egbuka‍, was really impressed with the Irish’s practice session. Clark currently has offers from Oregon, Oregon State, Washington State and Utah State. He doesn’t have any more visits on the horizon, but does plan on remaining in touch with the Irish. Clark would love to add that offer. “It’d be big, especially coming from a school like Notre Dame,” he said.